Since arriving in Aberdeen four years ago, Derek McInnes has transformed a lower mid table side into one of the best teams in the country. In addition to winning the club’s first trophy in over twenty years, Aberdeen have finished runners up in the league for the past two seasons. With a nine-point gap between themselves and third placed Rangers, they’re well placed to repeat the feat for a further year. This article will look at Derek McInnes’ recruitment policy in his time at Pittodrie. It will examine the benefits of this approach, as well as its potential risks. In terms of transfer policy, Aberdeen have tended to look at the “known”. Of the current Aberdeen squad, just five had no experience of Scottish football before coming to the Dons. In terms of players who’ve made the most impact, Kenny McLean was a promising midfielder for St Mirren, Niall McGinn was a squad player at Celtic, while Jonny Hayes, Adam Rooney and Graeme Shinnie all arrived at Pittodrie after spells at Inverness Caley Thistle. It’s a transfer strategy that’s been relatively low risk. There are no language or cultural barriers for new signings, and they all know the caliber of their opponents. This means they can settle at Pittodrie in no time at all. 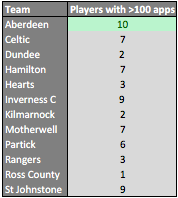 Meanwhile, Aberdeen have 10 players who have made 100 or more appearances for the club- the eldest of which, Andrew Considine, only turned 30 this month. This is more than any other team in the league. Derek McInnes has found a side that he likes, and has stuck with it. The benefits of this approach are obvious: the players understand the nuances of each other’s game, they know exactly how their manager communicates, and they know the standard of performance required. It is this stability that has resulted in two consecutive runners-up finishes in the Scottish Premiership: the most successful period since Willie Miller’s spell as manager in the early nineties. However, there are two downsides to this approach: one short term and one long term. In the short term, it means they’re unlikely to challenge Celtic for the title. As Aberdeen only tend to recruit from within Scotland, it means that they’re unlikely to “steal a march” on Celtic on domestic talent. While Aberdeen have undoubtedly signed talented players, the brightest prospects have all ended up at Parkhead. Over the past few years, Stuart Armstrong, Leigh Griffiths, Ryan Christie, Gary Mackay-Steven and Nadr Cifci have all gone for the higher wages and European football on offer in Glasgow’s east end. For as long as Aberdeen are competing in the same box as Celtic, they’ll never beat them. They may be “best of the rest”, but to close the gap at the top, they need to look further afield. There is also a long-term issue with a recruitment policy that sticks with the same guys year in, year out. 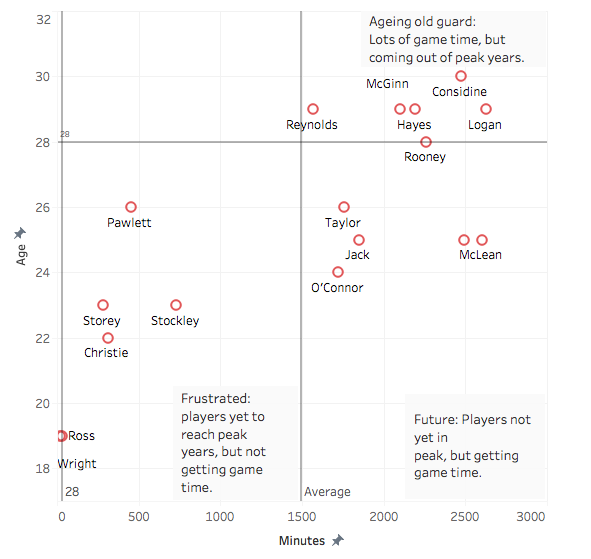 The peak age for footballers, except goalkeepers, is generally accepted to be between 25 and 30. Kenny McLean apart, Aberdeen have tended to sign players within their peak years. As such, the Dons now face the problem of many important first team players reaching the age of 30 without obvious replacements. Of course, nobody turns into a bad player overnight. However, Manchester City have had to spend hundreds of millions on rejuvenating an aging squad to compete for the league title down South. While the differences between the English and Scottish leagues are obvious, the point remains: making wholesale changes to a squad is both risky and expensive. For most teams, this year’s Scottish Premiership has been a competitive one. Such is life when the champions remain undefeated in April, and the promoted side have taken far more points off teams than the relegated one last year. In terms of points, just three teams are better off this season than last. For Aberdeen, their on-pitch performance has improved. They’ve scored nine more goals this year, and conceded ten fewer. This has come from taking 83 more shots at goal, while allowing 41 fewer in the opposite direction. Yet, in spite of this, McInnes’ men are still one point worse off this season than they were last. Next season, it seems likely that Hibernian will be promoted after a three-year absence from the top flight. The Edinburgh side are one of the best supported sides in the country, and will surely have more resources than the team they replace. This means it is likely that next season’s Scottish Premiership will be even more difficult, and Aberdeen will have to do even more to just stay where they are. There are two approaches Derek McInnes and the Aberdeen board can take. The first is that they’re the second-best team in the country, and if it ain’t broke, don’t fix it. 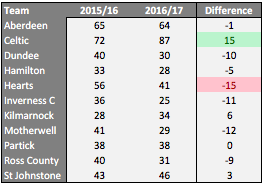 While this may hold true next season, and potentially the season after, it ignores the ever-aging squad, and assumes that Rangers, Hearts and Hibs (all with some of the youngest squads in the country) will not see an improvement in performances. The second approach is to be bold. The existing policy of buying proven, domestic talent in their prime years does work, and should not be scrapped completely. However, for the Dons to be anything more than the second best in Scotland and out of Europe by August, they need to open themselves up to the unknown. Looking at players in Croatia, Iceland and Portugal may be risky. They could come to Aberdeen and hate it. They could flop. They might not understand a single word Derek McInnes says. However, Aberdeen could beat the wages on offer in these countries and then some. When you’re facing rivals who have better finances, bigger crowds and wider infrastructure, these are the gambles you need to take to get ahead. This summer is a big one at Aberdeen. They need to start looking at players who are either younger, or from further afield. Failure to act soon will result in a lot more pain further down the line.